The UK's much-loved Cornish pasty could be hijacked by a horde of US imitations under an EU-US trade agreement being negotiated in Brussels. Critics of the deal warn it could also lead to the spread of genetically modified products in UK stores. Germany’s agriculture minister says the European Union (EU) wouldn’t have the power to uphold legislation protecting regional food specialities under the controversial Transatlantic Trade and Investment Partnership (TTIP). As a result, Germany’s famous Black Forest Ham and Cornwall’s internationally renowned meat pastries are in jeopardy. Trade unionists and campaigners opposed to TTIP warn the trade agreement will undermine UK food safety standards and regulations, paving the way for British shops to stock sub-standard and genetically modified US produce. Nevertheless, negotiations between Brussels and Washington are ongoing, and are being conducted primarily behind closed doors. Germany’s agriculture minister, Christian Schmidt, has confirmed protections for speciality foods may have to be forfeited once a final deal is reached. The minister for agriculture said America’s trade representative Michael Froman had flagged the issue with him during recent TTIP discussions. Schmidt made the comment in an interview with German magazine, Der Spiegel. He argued the rescinding of protection for gourmet food specialities, such as sausages and cheeses, was simply the price Europeans must pay for having the opportunity to take advantage of “free trade” with a colossal US market. The erosion of EU sovereignty? Under existing EU law, protected regional food specialities, like the acclaimed Cornish pasty, can only be sold under their classic names if they are produced in the relevant region. The legislative protection offered to products in the EU doesn’t apply in the US, however, where variants of European delicacies commonly surface. Roughly 60 UK products are on the EU’s list of protected status foods. The list contains 1,100 foods in total, and includes Prosciutto, Parmesan, Feta cheeses, and Black Forest Hams. While Stilton, Melton Mowbray, Pork Pies and Cumberland Sausage are among UK food products currently protected in the Union, TTIP is not currently considered a risk to them, as they are not imitated by US food producers. The same, however, cannot be said for Cornish pasties. As the fate of the humble pastry remains unclear, TTIP raises important questions about the changing face of EU sovereignty and Europe’s food industry. The Cornish Pasty Association secured an EU-backed “protected geographical indication” (PGI) for their delicacy in 2012 in order to prevent misrepresentation of the product’s brand name, which is part and parcel of Cornwall’s heritage. The association told the Telegraph the Cornish pasty trade is worth £300m annually – roughly 20 percent of Cornwall’s food and drink industry. While Cornish pasty bakers welcome TTIP, because it will terminate an American ban on importing meat products, they are adamant the pastry’s protected name remain out of ongoing negotiations. “The name Cornish pasty is not for compromise,” Ruth Huxley, a spokesperson for the Cornish Pasty Association and managing director of Cornwall Food and Drink, told the Telegraph. 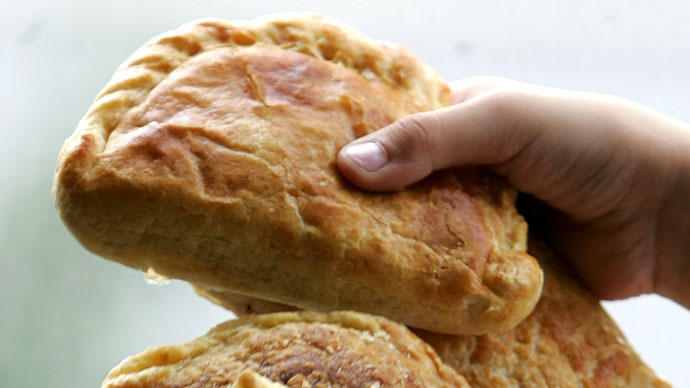 Marion Symons, who has run the Portreath Bakery in Redruth making the famous Cornish pasties since 1989, agrees the EU’s protected food status for the pastries should remain intact. “The geographical indicator for Cornwall is very important. For me as a small producer it gives scope to expand,” she told the Telegraph. In November 2014, Prime Minister David Cameron pledged to fast-track TTIP at the G20 summit in Brisbane. His vow infuriated trade unionists and campaigners opposed to the transatlantic pact, who fear the permanent privatization of the NHS and erosion of Britain’s food standards. While Cameron suggests TTIP could earn the British economy £10 billion, research from Tufts University’s Global Development and Environment Institute suggests it will culminate in job losses, slowed growth, lowered wages and a more volatile and unstable European economy.